Ease the pain this weekend and on April 17 with these free food offers from restaurants across the country. Feeling a little gloomy about Tax Day? April 17 might be one of the most dreaded days for Americans this year, but some businesses are hoping to change that with some classic comfort: food. Whether you’re stressed from filing your taxes at the eleventh hour or bummed that you had to dip into your vacation fund to pay the IRS, here’s something to cheer you up: plenty of restaurants across the country are offering free food to help ease the pain. Start April 17 off right with a delicious breakfast. Just go to any Hardee’s location between 7-10 a.m. and say the password “Made From Scratch” to get a free sausage biscuit. Hey, you've already paid your taxes — you've earned it! Celebrate getting those doggone taxes over with by noshing on a free turkey or veggie dog on April 17. In honor of what it’s calling “National Chill Out Day,” Kona Ice is offering free shaved ice from its trucks on April 17. The company’s motto? “No taxation without relaxation!” We can get behind that. A cookie makes everything better, right? And it's even more delicious when it doesn’t cost anything. Stop by a participating Great American Cookies store on April 17 for a free Cookies & Cream Cookie. Visit the sandwich chain on Tax Day and get a free small original sandwich when you buy chips and a medium drink. This Mexican-American restaurant chain is helping you rake in all the chips on Tax Day. You can get one free small order of chips and queso with the purchase of any other menu item. Just head to any store and use the password “chipping in” to get the offer. Treat those dependents to a free meal. From Saturday, April 14, through Tuesday, April 17, kids under 12 will receive one free Hooters Kids Meal with any restaurant purchase totaling at least $10. Here’s another deduction that will be appealing for parents. For every large pizza purchased between April 17 and 19, guests will get one large cheese pizza free. 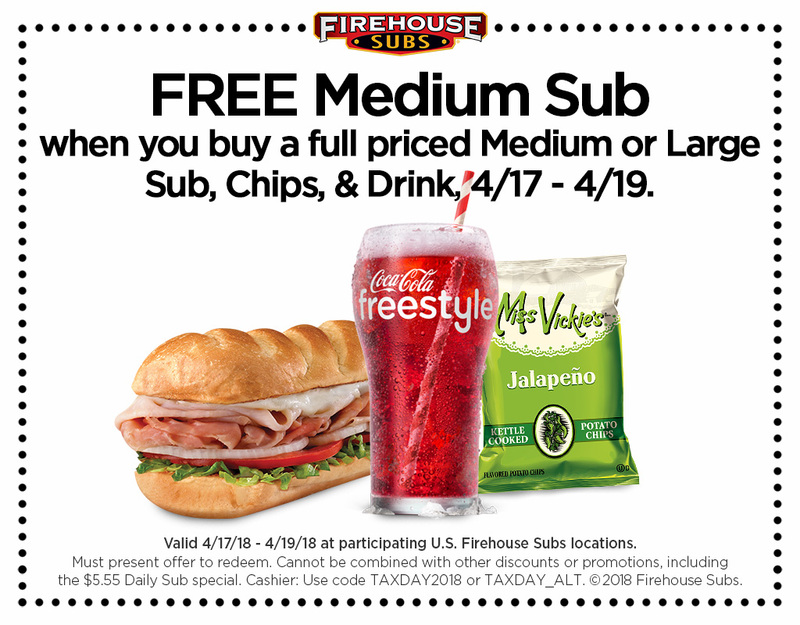 Buy one large pizza at Chuck E. Cheese's between April 17 and 19 and get one free.CEC Entertainment, Inc.
Show up to the sandwich chain with this coupon to receive a free medium sub with the purchase of any medium or large sub, chips, and a drink. The offer lasts from April 17 through April 19. Visit the family-friendly steakhouse chain from April 14 through April 17 to receive a free Kickin’ Shrimp appetizer with the purchase of any entrée.